Participants at Monday evening’s Your Voice Ohio forum in Washington C.H. wrote down notes on what they believed to be the steps to combating the opioid crisis in the community. This list was shared with the Record-Herald by one of the forum participants: Community education, prevention with youth, acceptance, accessibility of information, getting leaders and influencers on the same page, recovering addicts speaking out, family help, keeping the conversation going, mental health education, helping people find their voice and become their own advocate, life skills education. Art with Impact: Movies for Mental Health OLIVE Film Collection contains cutting edge short films about mental health. Supported in part by the National Endowment for the Arts, the film project shares free movies based on real-life stories that can be watched by parents and students anywhere by streaming online. Community members in attendance at the Your Voice Ohio opioid forum this week in Washington Court House said there was an increased need for resources and information in Fayette County and that the issue of addiction includes mental health, youth prevention, and combating the stigma surrounding treatment and recovery. The Record-Herald was asked to publish information on where to get resources. The following article is one example of a free resource to help communities with addressing stigma and mental health and contains a listing of streamable films and local resources. Art with Impact: Movies for Mental Health is a film project aimed at reducing the stigmatization of mental illness among teens and young adults. The project hosts and teaches workshops in schools and colleges across the country. The workshops give students a space in which to talk about stigmatizattion and mental health disorder and is supplemented by relateable films to help start the conversations. Art with Impact: Movies for Mental Health OLIVE Film Collection contains cutting edge short films about mental health. Supported in part by the National Endowment for the Arts, the film project shares free movies based on real-life stories that can be watched by parents and students anywhere by streaming online. Look for the film list included in this article. When I first started working for Art With Impact I didn’t have a complete understanding of just how powerful film could be. In fact, my knowledge of film production and other film technicalities is historically extremely limited (evidenced by my use of the term ‘film technicalities’). However, after more than a year of working with Art With Impact I am completely transfixed by the “connective superpower” of film, and especially, short film. We’ve all experienced it: that powerful feeling of possibility and purpose as the lights come up after a moving documentary or feature film. The motivation to make real and lasting change. And then, slowly, in the absence of concrete ways to engage, those feelings fade as we are immersed in our day-to-day routines. The work we do at Art With Impact allows us to bridge this gap between the power of film to create actors for change with concrete opportunities to act, specifically within the realm of mental health. Now, let me get back to my first point (you know, the one where I state I have no film experience whatsoever). In witnessing and facilitating our Movies for Mental Health workshops, I’ve made a few observations about how film truly does reduce the stigma of mental illness within college campuses, corporate environments, and local homeless residences alike. Ever wonder what it’s really like to be inside someone’s daily thought process that lives with obsessive-compulsive disorder? Even with minimal props, locations and budget a film can bring you inside someone’s intimate experience, making you realize the frustration and anxiety that persists in a number of different mental illnesses. And in these nuances, you become intimately connected with those characters. See Rinse and Repeat, for example. Watching a film on a large screen in a room full of strangers (or as we call them, new friends!) and then talking about the narratives immediately is a powerful experience. Film has this ability to create unspoken connections with those around you, and is a universal language that we can all understand. We see similarities between ourselves and characters and ultimately know that while those around us may not be connecting with the same components as us, they are connecting with an equal sense of personal and emotional engagement. Take the film Three, for example. The misunderstanding of mental illnesses causes devastating barriers to understanding and treatment. We know how powerful stigma is in our society, and I’ve witnessed time and time again how impactful film is in breaking down misconceptions surrounding issues related to mental health. Films also allow for diversity and can share different voices and representations. When we are encouraged to look at characters as real people and discuss these experiences with our peers we are building a culture of humanity and support. See Gladys or The Blind Stigma, for example. Viewing a moving short film that broadens understanding of mental illness, and then being given the opportunity to engage with others immediately is the most effective way to create meaningful and lasting change. When we know that our opinions are valid and shared in our individual passion to reduce the stigma associated with mental health and have our voices heard, the opportunity to actively get help or volunteer to create change will turn into a reality. I invite you to check out our film library for honest and unique ways to look at issues related to mental health that are often misunderstood. Being able to guide Movies for Mental Health workshops and witness the audience’s shared experiences translate into immediate empathy has been such an incredible lesson for me. We all have the ability to develop compassion, we just need to create more stigma-free and inviting spaces that provide these unique learning opportunities. Maybe I’m biased, but I’m pretty sold on the transformative power of film to generate this greater societal understanding on the topic of mental health. Don’t believe me? Have a look for yourself! https://www.recordherald.com/wp-content/uploads/sites/27/2018/02/web1_FinalWeb.jpgParticipants at Monday evening’s Your Voice Ohio forum in Washington C.H. wrote down notes on what they believed to be the steps to combating the opioid crisis in the community. 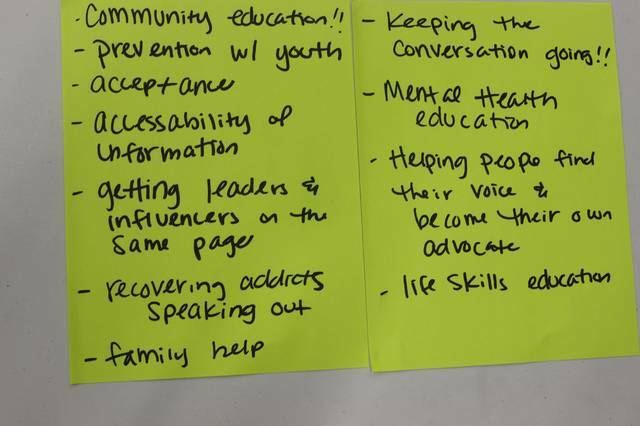 This list was shared with the Record-Herald by one of the forum participants: Community education, prevention with youth, acceptance, accessibility of information, getting leaders and influencers on the same page, recovering addicts speaking out, family help, keeping the conversation going, mental health education, helping people find their voice and become their own advocate, life skills education.